Global Edulink is determined to provide you with highly skilled and talented teachers, who will supervise and guide you during this Business Ethics Diploma. Learning comes with great benefits, and as such, Global Edulink ensures you are given the most effective lessons and exams to dramatically improve your skills and knowledge when it comes to business ethics. This course will deliver everything you need to ensure that your business will climb to the top, making your skills highly desirable to potential employers. You are given modules and exams to refine your skills in public relations, the global business environment, environmental issues in business, and much more! Once this course has taught you the rules and ethics of business you will have an edge that your competitors do not, making you the perfect candidate for many jobs within the business sector, including that of a Business Ethics Consultant. The course covers a wide variety of extremely helpful modules, from the Fundamentals of Business Ethics, to Government Relations and Business, you will receive a thorough education in Business Ethics and the confidence to obtain a career in your chosen field. As well as a great curriculum, you can enjoy working at your own pace through our range of enjoyable lessons and activities, Global Edulink provides course material like video tutorials so that you can make it work for your lifestyle. Our online course is so well designed you will feel that you are in the classroom! This course is comprised of professionally narrated e-Learning modules, interactive quizzes, tests and exams. All delivered through a system that you will have access to 24 hours a day, 7 days a week for 365 days (12 months). An effective support service and study materials will build your confidence to study effectively and guide you to secure your qualification. This course is available to all students, of all academic backgrounds. However, a sound educational background would be an advantage. Successful candidates will be awarded Diploma in Business Ethics – Level 3. 4. HOW TO UNDERSTAND THE RELATIONSHIP BETWEEN BUSINESS, GOVERNMENT, SOCIETY & PUBLIC RELATIONS? How to understand the Relationship Between Business, Government & Society? 9. WHAT ARE ANTITRUST LAWS IN BUSINESS? What are Antitrust Laws in Business? 15. WHAT ARE STRATEGIES OF SPECIAL INTEREST GROUPS? What are Strategies of Special Interest Groups? 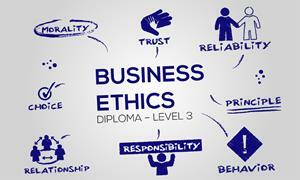 Fill out your details to find out more about Business Ethics Diploma-Level 3.